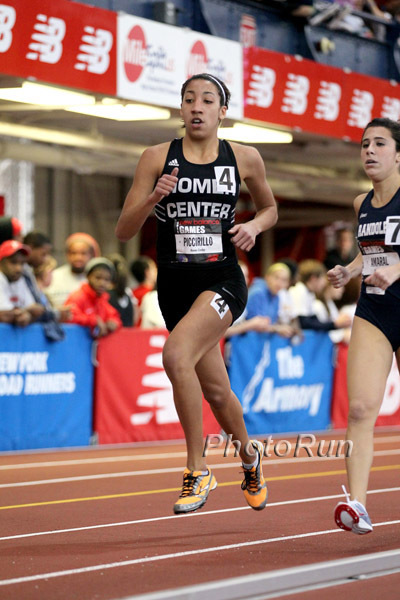 Angel Piccirillo enters her senior season as one of the top distance runners in Pennsylvania, as well as the U.S. Bursting on the scene as a sophomore - Piccirillo won her first of two indoor state mile titles, first of two outdoor 1600 meter titles and first of two Penn Relays COA titles. Adding to her junior hardware, she won her first state cross country title and qualified for Foot Locker Nationals. 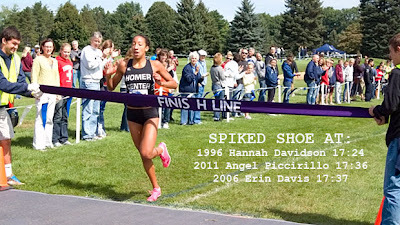 And she also received an invitation to the adidas Dream Mile in New York last June. A voracious lasagna connoisseur, Piccirillo can be found the night before any race at a local authentic Italian eatery, matching anyone in the place, bite-for-bite. Follow Angel for the next few months as she journals about her final season of cross country. For my final visit, I was headed to Knoxville, Tennessee. I was so excited for this visit because there were definitely some big things on the agenda. I didn’t have a race that weekend (thankfully because I was coming down with some kind of throat soreness and head congestion, resulting in fatigue, not ideal conditions for anything but I was so glad I didn’t have to race feeling how I did) so I was able to fly out fairly early and get a good start to things. I had Saturday of from practice since it was my travel day and I had to head down to the airport at about 7 in the morning to make my flight. There is no direct flight to Knoxville from Pittsburgh so I had a little more traveling to do than I had to any of my other visits which was fine with me. I went through the airport without a problem and was in Knoxville before I knew it. When I arrived in the Knoxville airport it was really cool because just about everyone that I saw was in Tennessee orange, because it was game day. I was already getting excited for the game we were headed to that night. Tennessee was playing Georgia that week so it turned out to be a really good game but before that, I met Coach Reeves and Coach Clark at the airport and we were headed back to campus. When I arrived at campus I was able to meet Chanelle Price which I was really excited about! She was my host for the weekend. I got to see a dorm but I stayed in her apartment with her off campus. It was so nice and I knew she had put a lot of time in it so I really appreciated her letting me stay there. I also met the other recruit that was there with me, Hannah Brown. She was so nice and we’ve never really talked at the races we’ve both been at before but I loved meeting her here! After we dropped all our stuff off, we were all headed to the game together. The hosts, Hannah and I really got to take part in some cool experiences while we were there. We stood on the field before the game started, then we were in the stand section, and for the end of the game we sat with the other recruits from the other sports, about 3 rows up from the end zone, which was so cool! After the game, we grabbed some ice cream and headed back to bed because of an early run in the morning. The next morning, everyone had a long run and we went out to the trails. They were so pretty and nice to run on. A lot of the girls had never been to the trails that we went to which was also really fun. It was a new experience for everyone! The run went well, we were fortunate enough to have perfect weather. After we finished our run we headed to the square which was a place more in town that had a bunch of really good places to eat! We all got lunch together then Coach Reeves took Hannah and me to see one of the trails they do a lot of their training on. It was a good trail for tempo’s and some quicker stuff, in a safe neighborhood. On the way home from the trail, we were headed to the lady Vols volleyball game! I was so excited to watch them play Ole Miss and the Vols eventually won that game! After the volleyball game came the Tennessee men and women’s track and field banquet. It was so inspiring to see those girls and hear their accomplishments (not to mention the food was pretty good too!). I was happy to see Chanelle getting a lot of awards, representing Pennsylvania! Once the banquet was finished, they showed us one of the houses that a few girls share together which was so awesome! I loved all their decorations and the way they had it set up! It was actually really nice too and reasonably priced! Now I had seen just about any option of living you could have, I think that was really important to see and make sure I understood. When that was all done, we were all pretty beat so it was time for bed again before another early rise, and long day. The next day was all about academics. We were also shown the weight room the men’s’ teams use and it was really cool, the lady Vols track and field team is one of, if not the only team allowed in there so that was a definite perk! Once we had gone through our day of academic meetings and tours, it was already time for me leave! I couldn’t believe how fast the trip had gone, but more importantly I couldn’t believe I was already expected to make a decision. Going into this experience I knew how hard it was going to be to decide, but I didn’t realize it would be this hard! It took SO much thinking, talking, and prayer! But I finally was able to come to a decision. I just really want to thank all the coaches that have done so much for me, all the girls for being so welcoming and doing such a good job making me feel at home, and finally my friends and family who are always supporting me! I could not have made this decision without my parents, Coach G, and Ms. Buffone (my school guidance counselor, who also played volleyball in college) I love all of them so much and I couldn’t ask for a better support system but I have finally decided…to verbally commit to Villanova, continuing my career as a Wildcat! I am really happy with this decision and I look forward to cheering for my future teammates this season! Yesterday was also an especially long day for me because I had to call a number of coaches to let them know what I decided and what my plans were but before that I had to do an interesting workout that my coach wanted to try that I have never done before. For my workout, I ran a 2 mile warm up to start then we were up at the track for some 400’s. I was originally told I would be doing 12 400’s under 80 sec pace, with very short rest which I knew would be difficult but manageable. After I had gotten through all 12 without a fight, coach G suggested I “Try” 4 more because he “Knew I could handle it”. So for the day I ended up doing 16 400’s at about 75 second pace, with a 2 mile cool down to finish it off. Now that I’m done I think it was a good workout especially because I have been having some troubles recently just from stress, and fatigue from my sickness, so getting in a good hard workout with some good results was nice! It was funny because the day before I had actually literally just about run into a runner from a college about 7 miles from Homer City, IUP, and we were able to run together for about half of my long run until I had to turn back for home, but it was really awesome I wasn’t alone. So I have had a pretty interesting few runs, and it’s been a pretty quick few days! Good luck in the Post season, everyone! Hey everyone! Sorry I didn’t get a journal out last week, I got swamped with school work. Having two visits back to back weekends, and missing back to back Mondays was hard. I’ve gotten all my work caught up so I will try to give everyone a run-down of the past few weeks. I had a pretty typical training week after Georgetown. I took the Monday I came home after traveling off of running because there was really no time, but was back to my normal schedule on Tuesday. I had workouts on Tuesday and Thursday and an easier day on Wednesday and a really easy day on Friday before my local race. I went to Donatello’s the night before this race and got some really good lasagna so I was set! The next morning we went to the course and I was not looking forward to this one. It was very cold in the morning and the course was really swampy! Everything went alright there, I didn't run the time I wanted to at all but I was glad I got to see another difficult course and get some more good preparation. After I was done with that race I had to get in the car and head to the airport. I was flying to Philly to visit Villanova at about 3 so we were in a bit of a rush because it takes about two hours to get there. I wasn’t very happy about my race but I was very happy to be able to visit Villanova. This is the visit I have had planned for the longest so it almost felt weird for it to actually be the date. I got to the airport without a problem and got there in plenty of time to get on my plane. I did run into a bit of a snag after security at the airport. After I walked through the scanners and was on my way to my terminal, I realized I couldn’t find my ticket. I must have left it in one of the bins that are put through the scanners. I was a little nervous but I was hoping it could be an easy fix and the people I have encountered working at the airports have always been really kind so I wasn’t too worried about it. I just gave my parents a quick call to make sure I could just get another one printed at the terminal itself. They didn’t think it would be a problem and it wasn’t. I got on my flight and was on my way to Philadelphia. When I arrived in Philly, Coach Gina Procaccio had told me that Amanda Marino would be picking me up at the airport. She is the graduate assistant so it was really awesome to meet her and get to talk to her about Villanova and her decision. She had a really interesting point of view because she had run at Villanova but was also coaching there now. You could tell she really loved the school, coach, and team! Once we got through the airport and found her car we headed to the school. It wasn’t a long drive from the airport but when we got there, the other recruits from that weekend were already there. Along with myself, Sam Nadal and Kelsey Margey were also visiting Villanova that weekend. That evening we went out to eat. I got lasagna of course, I had to check out how the lasagna is out in Philly and it was great! That night we hung out with most of the girls’ team and it was really cool. I think that is the most exciting part of these visits, meeting the teams and seeing what it will really be like for me in just one short year! The next morning, we were headed on a long run on one of the trails they run on the weekends. The trails were really beautiful and it was nice to get a change of scenery. Kelsey and I ran with Emily Lipari for our entire run (my host) and Sam ran with Sheila Reid. It was a good time to talk to the girls and see how they really feel. After our run we ate, got cleaned up, and headed to the King of Prussia Mall. I was the only recruit who went to the mall because Sam and Kelsey had major homework to do. It was such a huge mall, this was the first time I had ever been there and I couldn’t believe how many stores were there. That evening, the entire girls’ team went to Coach Gina’s new house for a ziti party. It was a nice way to see how the girls and coach interact in a different light. The ziti was amazing! We also watched some videos of the girls’ past season, race video and pictures that the assistant coach had made. We even got to watch some old race videos of Coach Gina, and they were really cool! That night we hung out with the team again and with our hosts, Emily Lipari, Nicky Akande, and Mary Bohi. They were awesome and really did a great job showing us around the campus and answering all our questions. It was nice to spend time with them and the other girls. The next morning, Monday, I was able to go to an anatomy class with Emily and Mary. Following the class, I had my meeting with Coach Gina. It was a time to get all my questions answered which was good. The girls had practice right after my meeting. I was getting ready to leave for the airport when they were starting practice. Just like that, my visit was over and I was headed home. I finished the trip off perfectly because I flew home on an international flight! It was a huge US Airways plane flying out of the international terminal of the Philadelphia airport. This was the biggest plane I had ever been on and it was awesome. After that I got back to school and went about a normal week. It was a little more stressful than usual because I had missed two Mondays in a row. I had research papers, projects, and AP calculus tests. I was feeling pretty beat, which is why I couldn’t get a journal written. I did have a race on the weekend and it was only an hour away, in Pittsburgh, which was easy on our budget. It does seem though that Coach G and I can’t catch a break. We were back to our old tricks this weekend with the school van. Against his better judgment Coach G decided to drive the school van to this race, it’s only an hour or so away, what’s the worst that could happen? In his defense, if he takes his own car he will not get reimbursed for the gas so it really only makes sense to take the van but anymore I don’t think he will think twice about not taking his own car. We had to make a quick stop at his brother’s house to pick up Coach G’s wallet that he had left at his brother’s wedding the weekend before. It was practically on the way, but when we pulled in to the housing development we heard a noise from under the van. We didn’t think anything of it until we drove a little farther and heard the same noise only louder and worse. Coach G pulled over and lo and behold we found that the muffler was now dragging on the road! Luckily Coach G’s dad is a mechanic and owns a shop in Plum, about a 45 minute drive. In the state of the van we are lucky we made it. It wasn’t a minute too soon when we finally arrived at Gentile Trucking, my new favorite car shop! Coach G’s brother and father both work there and got us back on the road without too much delay. We owe them for their quick work on short notice. I had really wanted to get out to Paul Short Invitational this weekend but considering I would have needed to miss even more school to go was just about out of the question, let alone the expense. With that being said, I want to say congrats to Julie Macedo on winning the high school girls race! But I definitely had my work cut out for me in Pittsburgh. I was finally going to get the opportunity to race Margo Malone and her sisters. We almost never get to race, even though we are so close. I was really happy I got to see her and we could push each other to a good race and time. They invited me to run their cool-down with them, which was also really cool because they were really nice. The conditions were pretty horrible though. It was probably the worst cross country race I’ve ever been in. It was sloppy and the mud was very slippery, but I was so happy to race in what I’ve kind of adopted as my hometown. The support was awesome and everyone there couldn’t have been nicer to me! It was great to get to talk to the people who have been behind me for so long but I don’t get to see as much as I would like. I loved meeting everyone and I can‘t thank them enough for their support! I was hoping for a faster time going into this race but when I saw the conditions I knew that that wasn’t going to happen. It was also hard to believe this was my last high school cross country invitational, so hard to believe! Overall this was a good two weeks for me, and I only have one college visit left. I will be heading to Knoxville, Tennessee this Saturday. I am not racing this weekend, and we have a half day Thursday, and no school Friday and Monday. I can’t wait for a long weekend, with no pressure! Good luck to everyone racing or visiting this weekend, everyone keep up the good work!